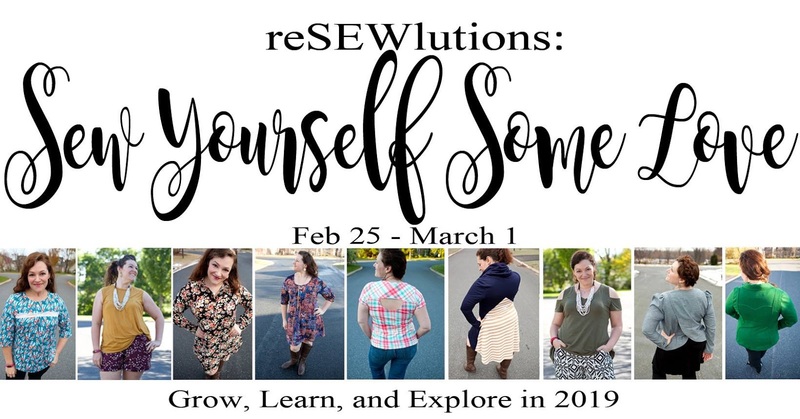 However, this Winter Wear Designs reSEWlution is about showing (and sewing) yourself some love with an addition to your own wardrobe! I usually sew for my kids - kid's clothing is more fun, and takes less fabric (so I have more to hoard, I mean use on other things), but I've really been enjoying adding to my me-made wardrobe. Magnolia is the perfect addition. 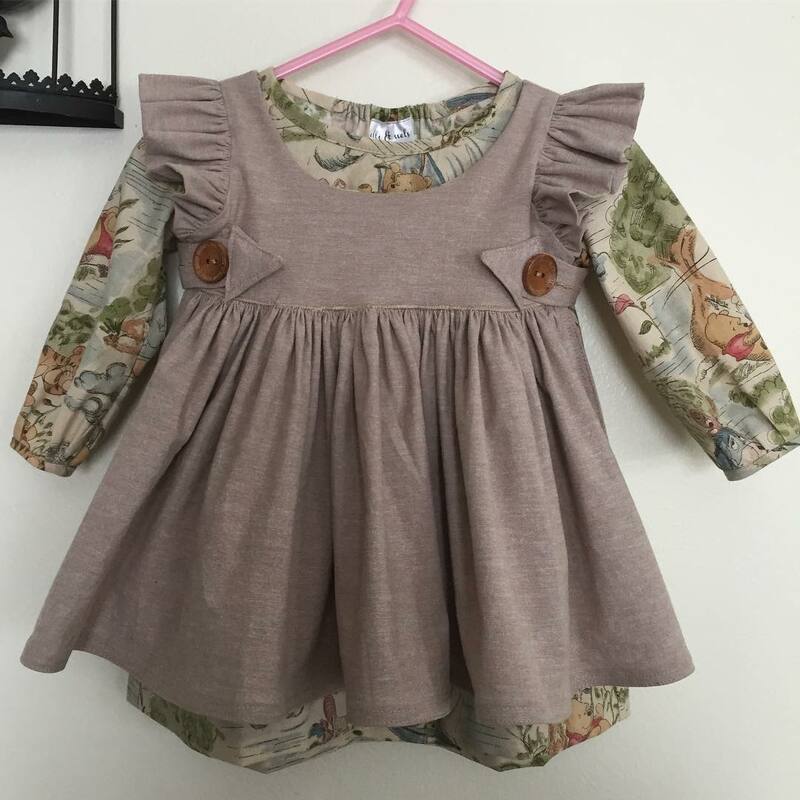 I bought this mustard floral DBP from Sew Blessed a few months back, and not long after I saw a picture of another sewist in a Facebook group wearing a beautiful dress with bell sleeves in a similar fabric. I've had that idea stuck in my head since, but I never put aside the time to do anything about it. Suzanne gave me an excuse (and a perfect pattern!) Magnolia has additional pattern hacks on the blog, so I downloaded the bell sleeves and cut the narrow ones. I think they're perfect. A wider bell would irritate me, being in the way all the time, but I love the extra length on these and the little bit of flair they add. I used the shirttail hem option on both front and back - hard to tell on the front at 35 weeks! ;) Once baby comes I think the curved hem will be a little more obvious, but currently it gives me that little bit of extra length that's so necessary for coverage. I love V-necks, and Magnolia offers the choice of a V or a scoop neck if you prefer those! There are more options for the back; a coordinating insert is one I debated, but ultimately couldn't find another stash fabric I could deem "perfect", so I left it alone. It's a quick sew, too. I've been sewing where and when I can, trying to get baby things done, and left this til the last minute (as usual), but I had no problem getting it sewn up. So satisfying to have a top that isn't boring; takes no time at all; looks great; is fun to make! My wardrobe can definitely use a few more, and I still have a lot of options to try out. 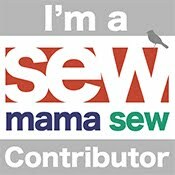 I hope you sewed yourself something beautiful this month! Check out what these other bloggers are making themselves and make your own reSEWlution! If you need a little more incentive than that, there's a 20% discount on ALL Winter Wear Designs' women's patterns! Click here! I think I had two weeks blending into one. Does that happen to you? I have knowledge of specific things happening on specific days, but I've lost track of whether they were this past week or the one before...and it's not like we've been so ridiculously busy, either. Time has just sort of blurred, and I'm not really sure where the last two weeks went! Needing: time to slow down! I'm coming up on 33 weeks this Wednesday, and that means I'll only have 5 left until baby is here. I'm not quite ready! I've been having fun making some baby clothes, but nothing that's needed right NOW...of course. I do have patterns readied for baby gowns so I think that'll be this weeks project - gowns and footie pjs. That's all baby will wear for the first couple of months, anyway! Cooking: as little as possible. Haha. If I were a more organized person I'd be putting together freezer meals in anticipation of this birth and the weeks after. I am not a more organized person. ;) The husband can do a very little bit of cooking, and with him and the crockpot I think we've muddled through before. That and good friends who are always kind enough to drop off meals afterward! How's your week been? Sunday Lately is a weekly meetup (link up here) by the Blogger Tribe. Next week's themes are Conspiring, Practicing, Gazing! Beginning the new year with resolutions is a tradition - but how about reSEWlutions? Do you have sewing techniques or patterns that you have wanted to try and never built up the courage? Speaking of courage, I took these pictures with my camera phone on selfie mode. In 19F "feels like 2 degrees" weather. You're welcome. This week we're talking about plackets. 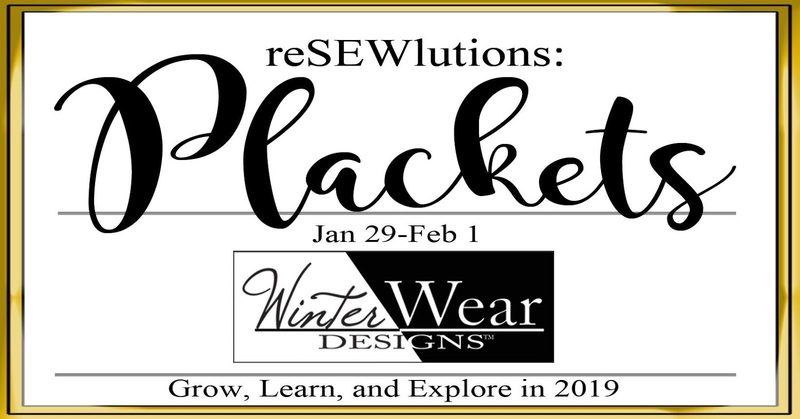 Plackets are a "resewlution" that I see come up every so often, and I think they're an important technique to learn! Some of my favorite styles have plackets, and there are so many types that make them so versatile in garment sewing. The only problem with waiting this long was that now I had to make it maternity friendly. Well, that was easy enough. After poking around the internet a while for ideas, I found that one was simply to make the front longer. Since I mostly wear the same RTW size now that I did pre-pregnancy, but none of my shirts fit, I decided to try that. I cut Blithe using the front and back pieces given, but when it came to cutting the bottom of the front, I laid the back piece on top, lined up the armscyes, and cut the tunic length shirttail hem for both pieces. This placket though. I love plackets, like I said, but I often find myself getting puckered corners, or folding something the wrong way - they are one technique I use that I MUST refer to instructions, every. single. time. I don't know if I'll ever be good enough at them to just DO one without thinking. I probably could use a few more buttons, honestly, but that's the danger of using your stash - I was hard pressed to find even the three that matched, and I'm still not sure one of them is exact! Lol. If you want a fun, breezy woven top with a beautiful (seriously, I can't say it enough) perfect placket, try Blithe. I'm in love. This is the first woven top I've ever sewn for myself, because I was never sure I wanted woven tops, but I do. OH I DO. And with a few more length, hem, and sleeve options, I won't get bored with it for a while either! I kind of love 3/4 sleeves though, so I might be "boring" and stick with those forever. We'll see! Did you miss a day of placket sewing? All the links are below for your inspiration!